An interesting and unusual job was commenced recently which involved the design of a laminated curved plywood crown display table which will be used as a display table for a birthday cake at a party. 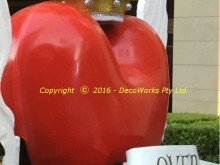 The final design will be a gold regal crown approximately 800mm high and 700m wide with a removable platter on top to accommodate the cake. The crown was first designed using CAD to get the proportions balanced and to determine the sizes of the individual parts and how they were going to fit together. 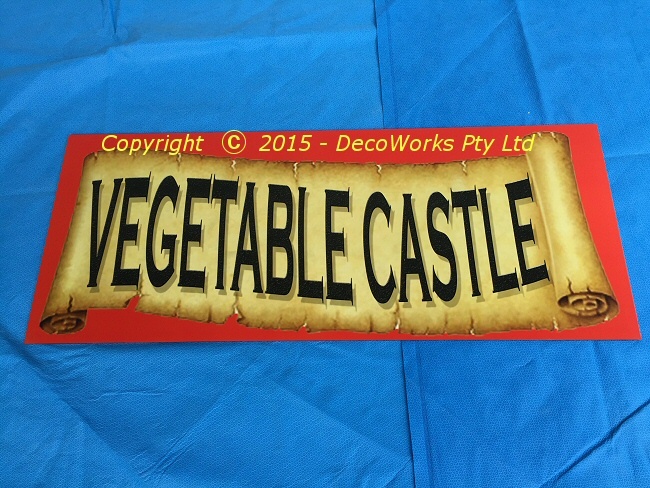 A scaled down version of the crown side profile drawn within a scaled grid was printed out on an A4 sheet of paper. 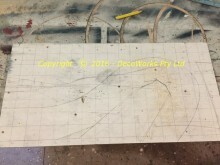 Next two sheets of 15mm plywood the size of the final profile were screwed together and a 1:1 grid was drawn onto the top sheet. The 1:1 profile shape was then drawn on the plywood using the scaled A4 printout as a guide. 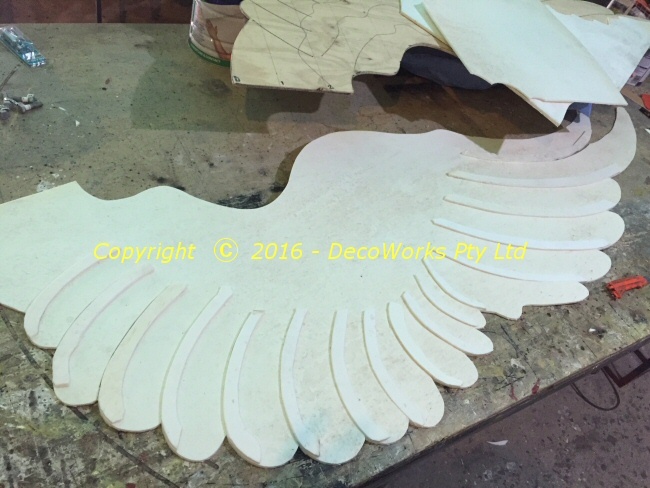 Once the profile shape had been drawn the rest of the form shape was added and the shape of the first form section was cut out using the bandsaw. 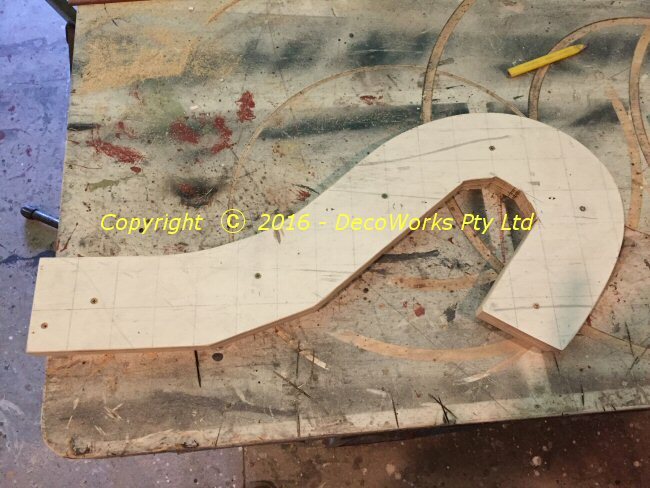 The plywood offcut left over after cutting this first form profile will be used later in the build to make the second half of the profile form. A belt sander was used to smooth the profile curves of the 15mm plywood *sandwich* so that both pieces are identical. 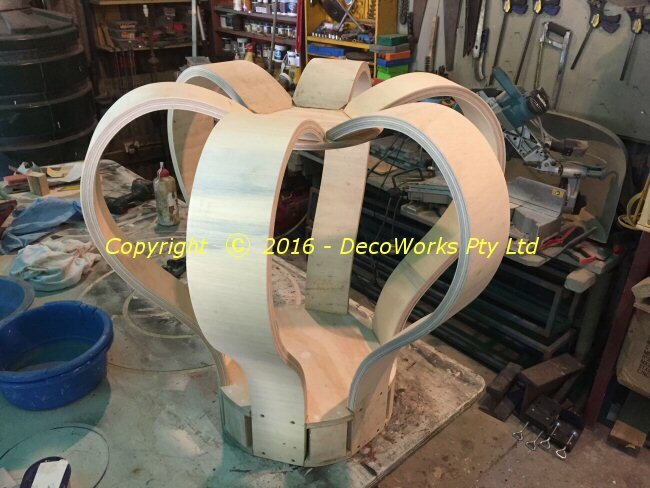 These two pieces of plywood will form the top and bottom faces of the profile form so it is important that they are the same so that a smooth curved surface can be achieved that will clamp the plywood laminates together with an even pressure across its surface. The finished width of the laminated curved plywood sections will be 120mm so the width of the form profile was made to be 130mm so the sections can be trimmed to size after each one is made. The two 15mm plywood sections are now separated and 100mm high blocks of wood are arranged along the profile curve as shown on the left. 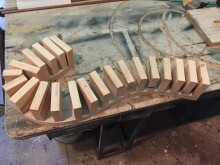 Once these have been glued and screwed the form profile is again smoothed on the belt sander so the blocks follow the contour of the top and bottom sections. 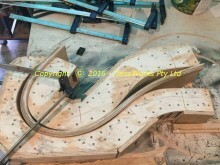 This ensures that the 4mm plywood skin which is next attached to this face of the profile is supported as much as possible so it wont deform when under pressure from the clamping process later. 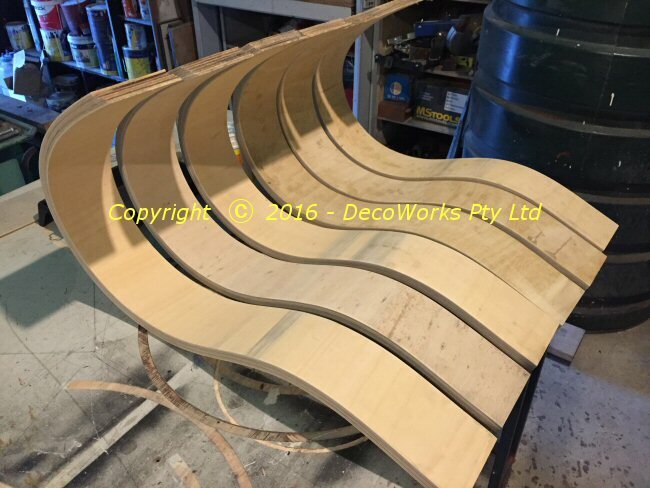 The curved plywood laminates will be approximately 20mm thick so the profile of the second half of the form must be 20mm offset from the profile of the first form. This ensures that when the two halves are clamped together there with be an even pressure along the entire length of the curved section making a uniform bonding of all the laminates. 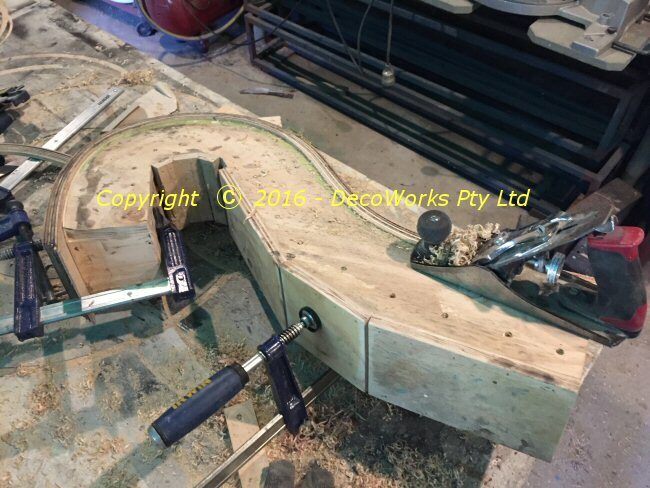 You can see in the picture how the completed first profile is placed on the offcut from which it was cut and a 20mm offset has been drawn along its profile. 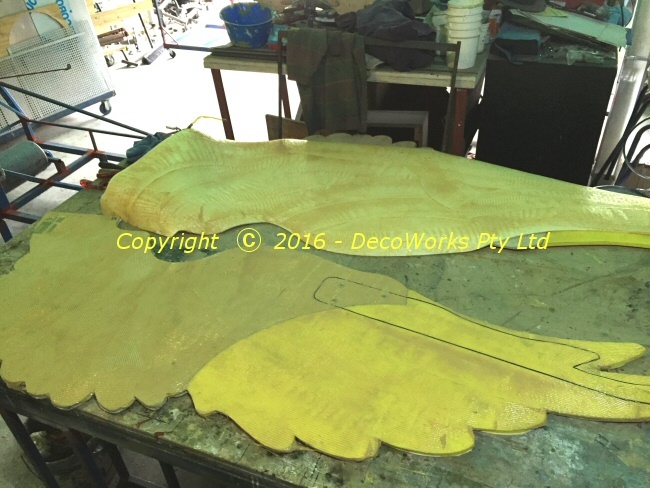 The second profile is now cut out on the band saw and the same process used in making the first form is repeated. 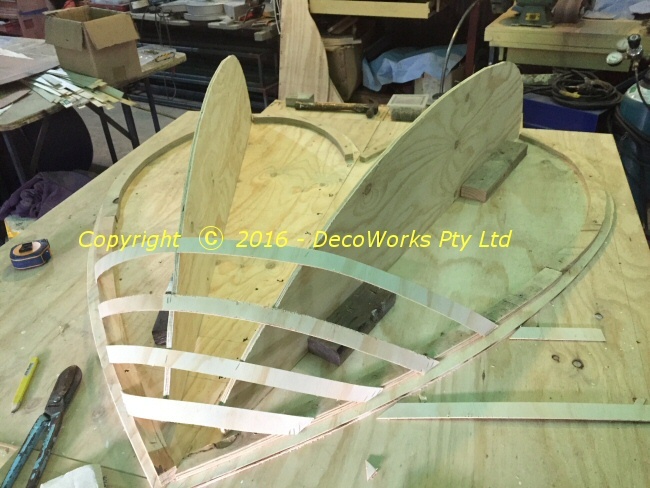 The two plywood halves are separated and 100mm spacer blocks are attached along the profile between the two halves. The inside profile is again sanded so that the spacer blocks follow the profile of the sides so that the 4mm plywood face will be well supported when the two halves are clamped together with the laminates inside. 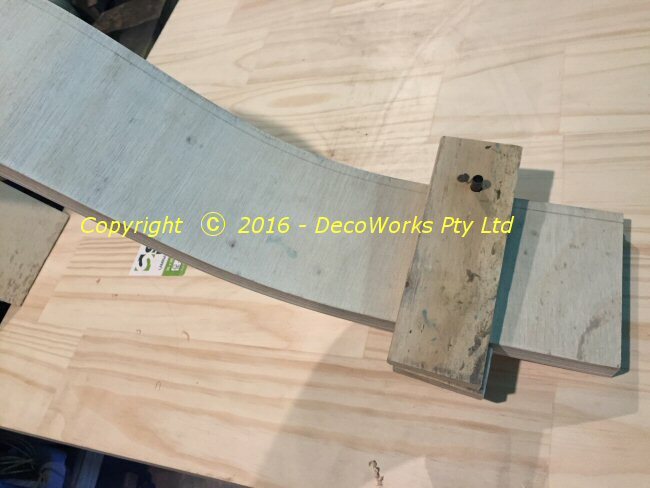 Now that both form profiles have been made we can make the curved plywood crown sections. There will be six 3.5mm plywood laminates needed for each of the six crown side sections. Strips of plywood 140mm wide are cut across the width of the plywood sheets. This is ordinary plywood and it bends much more easily across the sheet than along its length. 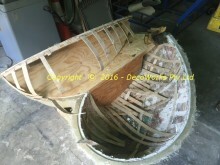 Once all the strips have been cut the glue is applied. 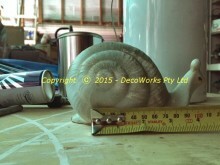 I have found that using a paint roller gives the best coverage over the plywood surface. 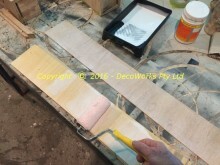 Prior to applying the glue I like to wipe a wet cloth over both plywood faces to ensure that there will be no dry spots and that the glue gets good penetration into the wood. 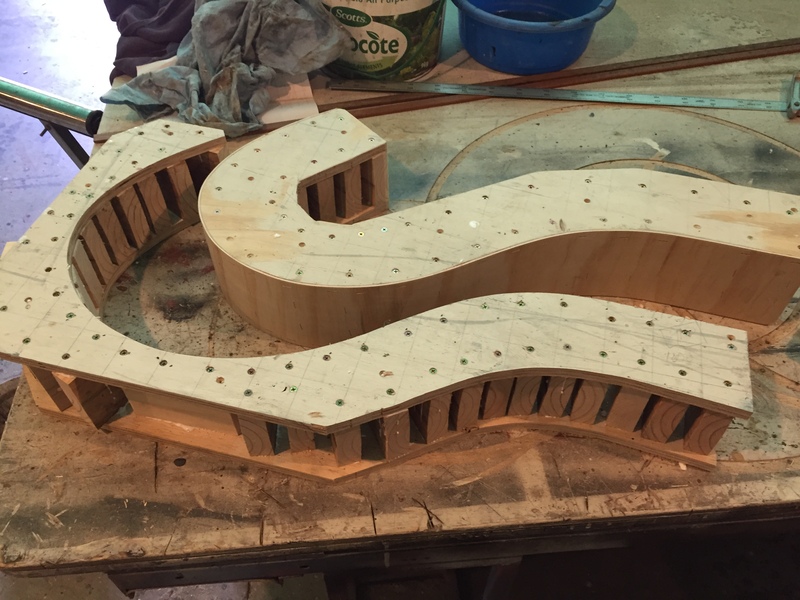 Both sides of each plywood strip are covered in glue (except the top and bottom of course) and stacked on top of each other. Next carefully lift the plywood laminate *sandwich* and lay it between the two halves of the profile form. You need to judge where to start forcing it into the profile so that it doesn’t come up short at either end. 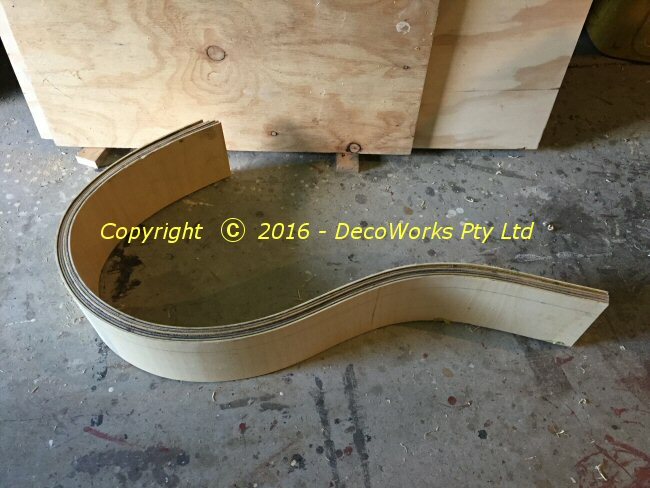 This profile has a particularly tight radius and the bending had to be done gradually and carefully to avoid snapping the laminate sections. I found it best to use the first profile form to push the *sandwich* into the form. 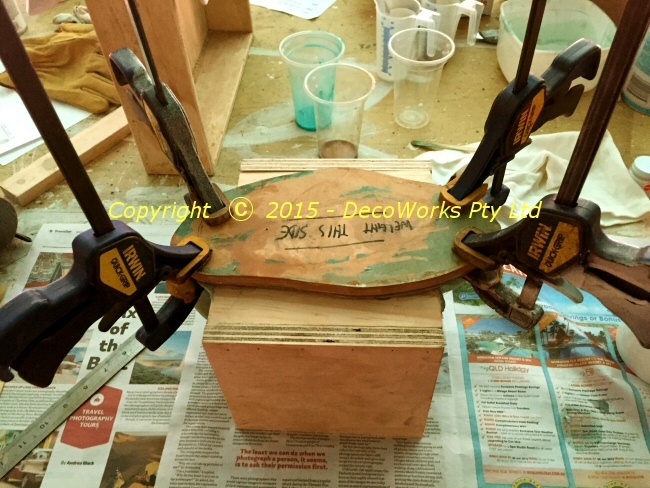 Make sure that the bottom form has a stop on the bench so it doesn’t move about as you manipulate the plywood into position. 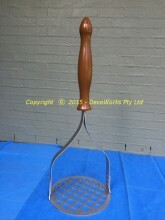 Once the *sandwich* was bent into the tight radius a clamp was used to gradually pull it further into the profile form. 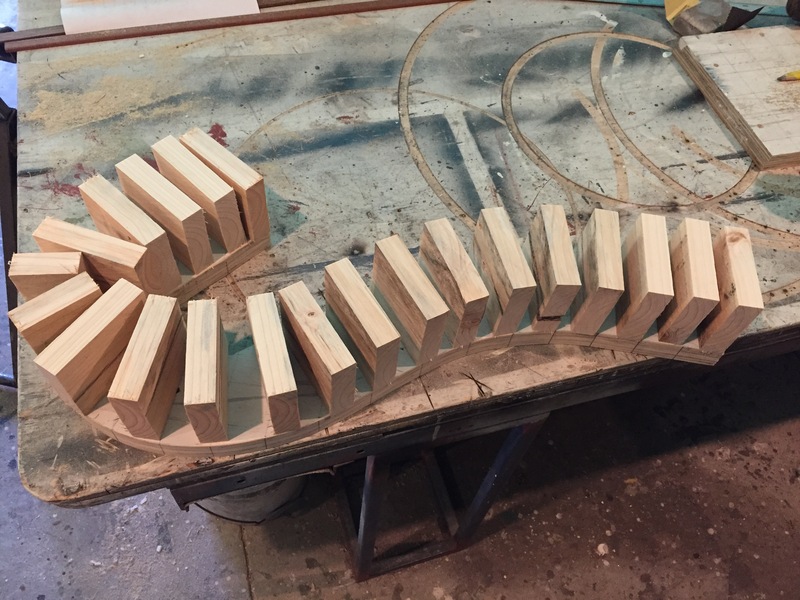 A bit of juggling was needed with several clamps to get a uniform thickness along the profile curve. A clamp on the right hand side levered the first form into the second to achieve a snug fit. Make sure that the individual laminate strips don’t slip too much out of position. 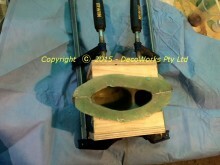 A wooden mallet can be used to tap them down flat before final clamping if they have moved out of alignment. Once you have both profile forms in position and are happy with the position of the plywood laminates several other clamps can be applied and tensioned so that there is an even secretion of glue along the entire length of the section. This is the best way to gauge whether you will get a secure bond. 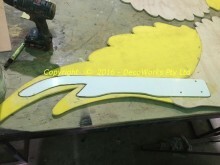 Wipe all excess glue from the laminates (top and bottom) before leaving to dry. 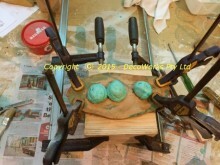 Leave it a good 24 hours before removing the clamps. After the glue has been allowed to dry the clamps are removed and the laminated section can be removed. 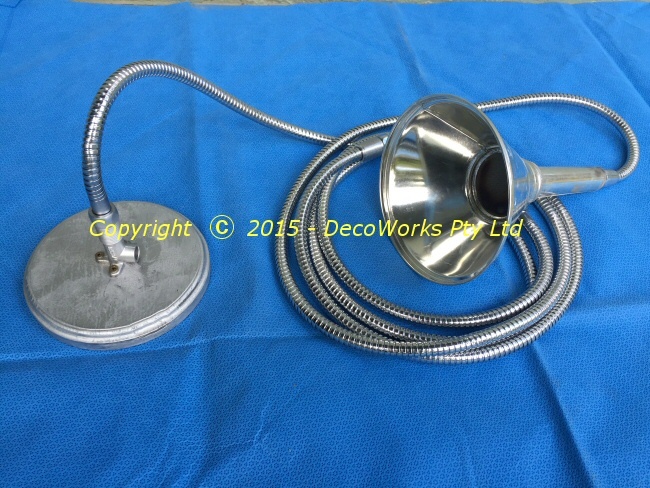 The section holds its shape very well with only a few millimetres spring back measured. The next step is to trim the *sandwich* width and trim both ends in preparation for assembly. The first thing to do is make one straight edge. Here is where the profile form comes in handy again as a means of holding the section securely while the edges are trimmed. 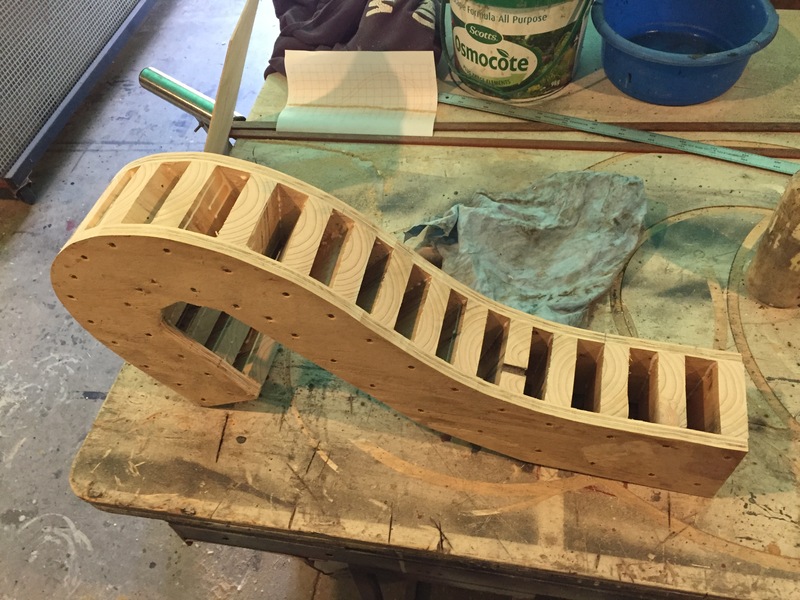 The most convenient and direct way to clean up one edge is with a hand plane. The section is securely clamped back onto the profile form with about 5-8mm protruding above the form face. 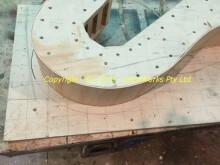 The laminated section is now planed back to the edge of the form so that all the laminated strips are at the same level. Once this has been done the section is removed from the profile form and the edge is sanded smooth on the belt sander. 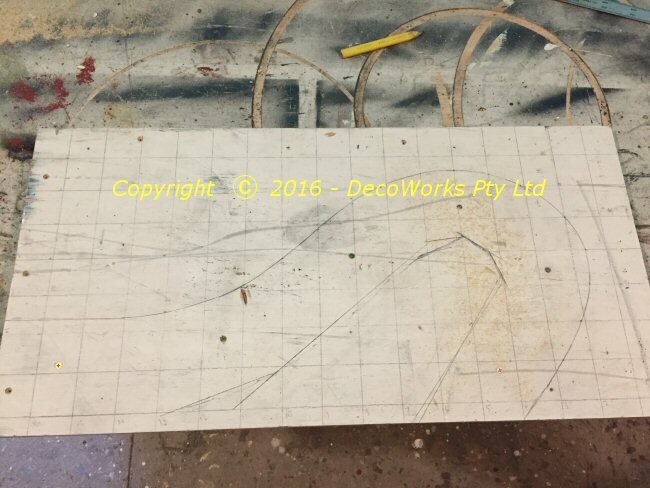 We now have a straight edge from which the correct width cut line can be marked. 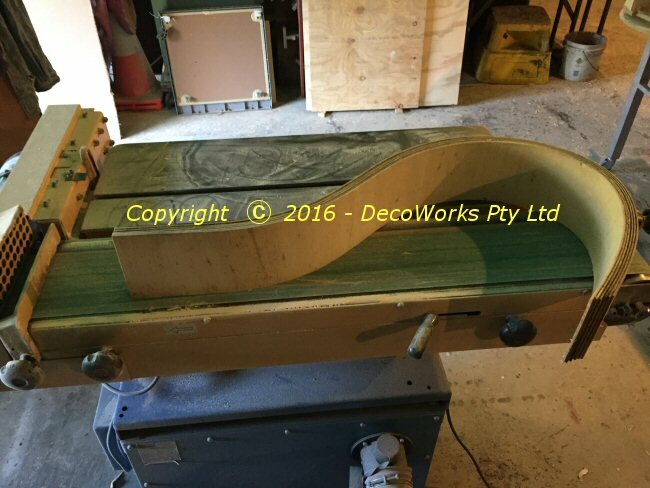 To save on a lot of hand planing a band saw was used to cut the majority of the excess width from the section. 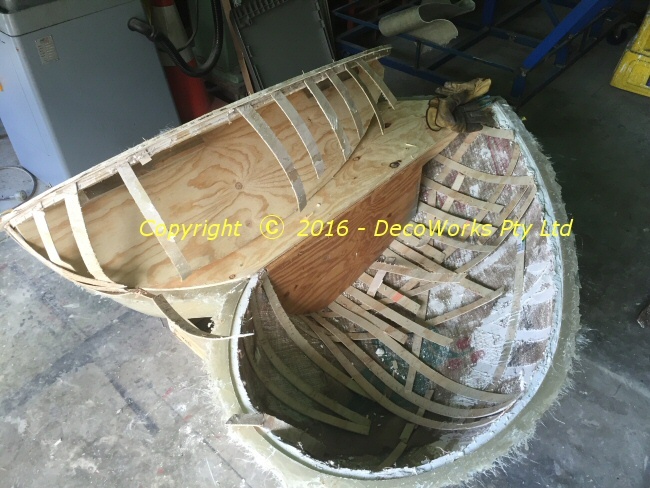 This needs to be done very carefully because of the irregular shape of the section. 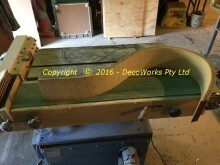 Once the section has been cut to width it is again put on the belt sander to smooth up the edge. 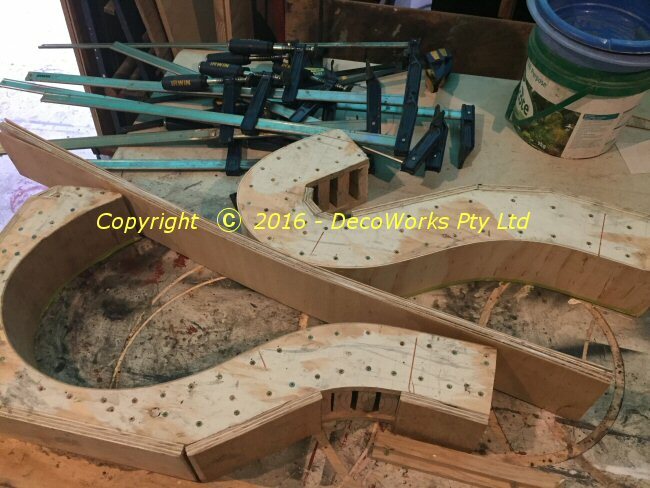 The final job is to trim both ends of the sections so they can be assembled as per the drawing. 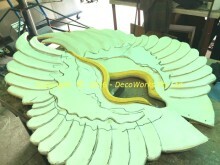 The procedure described above has to be repeated six times in order to make all the parts for the crown table. A circular base was made with six equal rebates cut around the circumference to accommodate the laminated curved plywood sections. 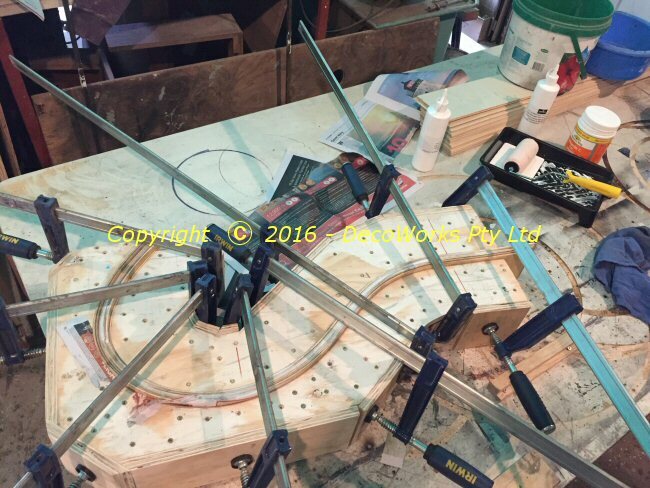 The crown table was now be assembled by glueing and screwing the sections to the circular base section and the upper support disc. 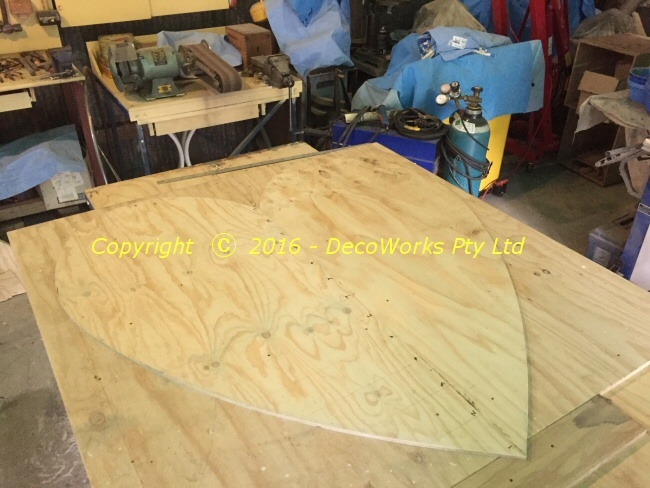 A strip of 1.5mm plywood is fitted around the base to hid the bottom of the side sections and give a cleaner look. 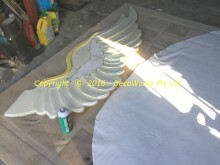 The next task is to undercoat and fill the framework in preparation for the gold finish. There will also be mouldings and trimming added to the frame to add to the visual appeal of the display table. 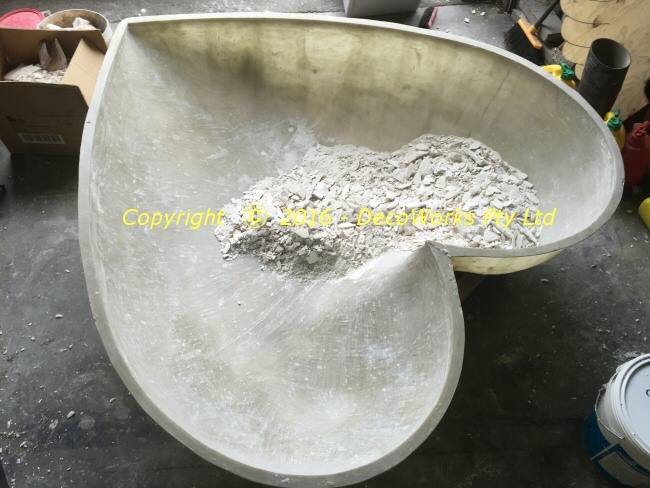 This process will be described in another post. 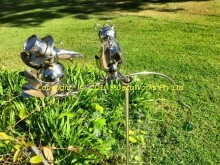 Copy of a bird mobile for the garden made in stainless steel. 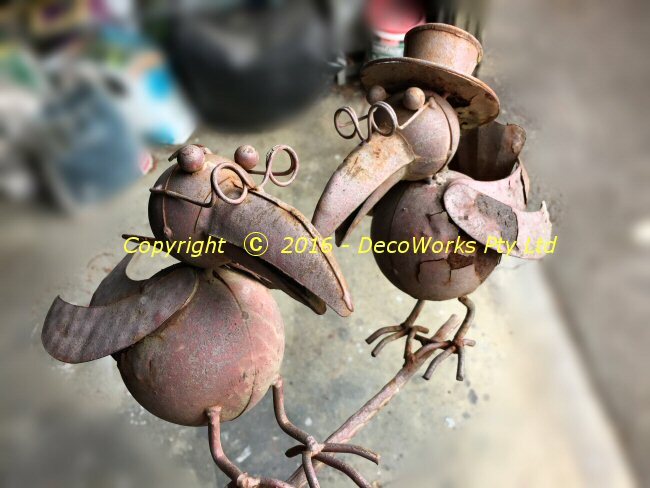 Several years ago on a trip through the Southern Highlands of NSW I saw this cute metal garden bird mobile which I thought would look great in the garden at home. 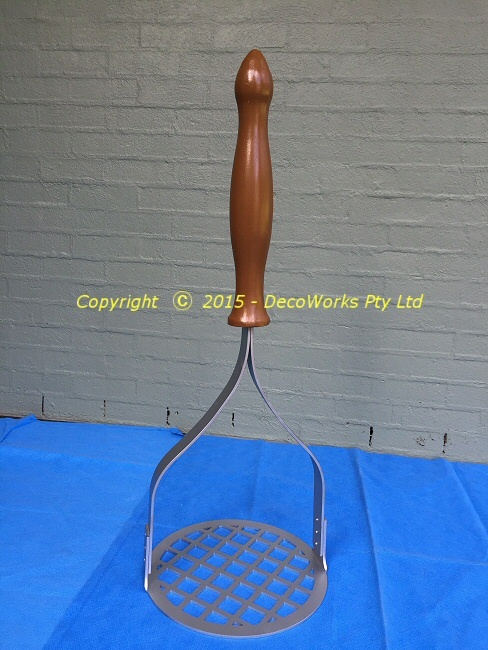 It wasn’t expensive so I bought the item and put it in the garden and enjoyed it for several years. It was made from thin tinplate with a weathered rust-like finish like many similar styled garden decorations available at Garden Nurseries around Australia. 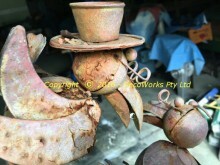 Unfortunately, being exposed to the elements, the painted rust finish finally gave way to very real rust and corrosion. Being made of thin tinplate it was reaching the point of falling apart and being useless as a garden ornament. 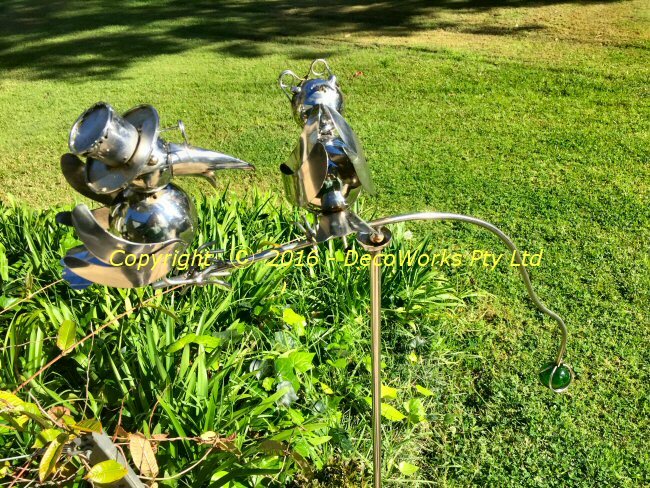 Because I liked it so much I decided to resurrect it and make a copy of the garden bird mobile in stainless steel which would eliminate future corrosion problems. 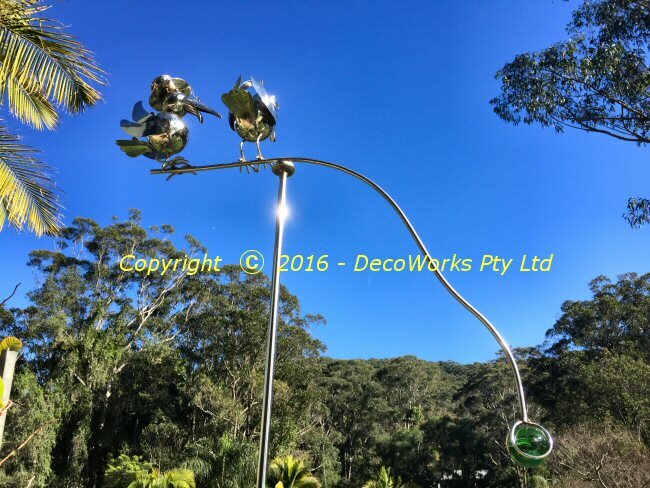 I based the reproduction on commercially available stainless steel balls welded together. 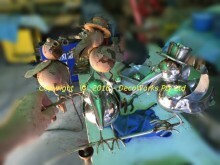 A variety of different thickness stainless steel rods and wires were obtained to make the feet and spectacles. 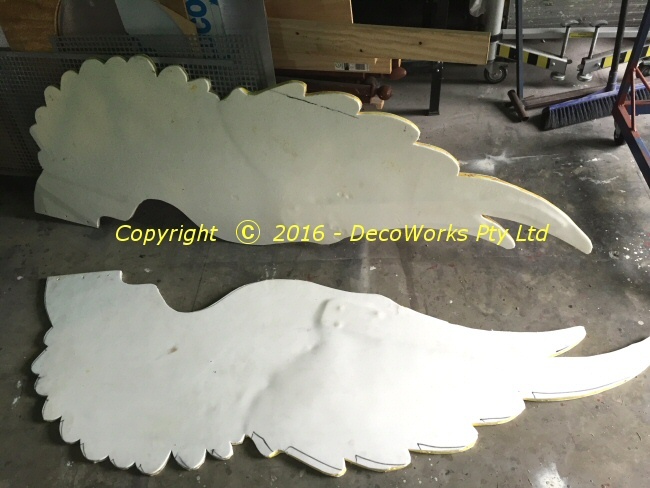 The wings, tail and top hat were cut from a small sheet of 0.7mm stainless steel sheet. 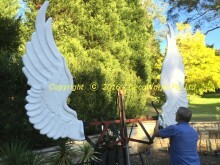 After all the parts had been made they were assembled, balanced on their perch and then placed back in the ground making a sparkling addition to the garden in the morning sun. The recent Wayside Chapel winged heart project had two large wings that flapped up and down under the control of a pneumatic cylinder. 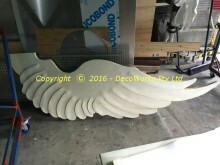 For safety reasons it was decided to make foam wings so they would be flexible enough to prevent someone getting their head taken off if they happened to contact a wing when it was operating. 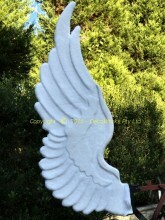 However part of the wing had to be structural for the correct flapping motion to be achieved. 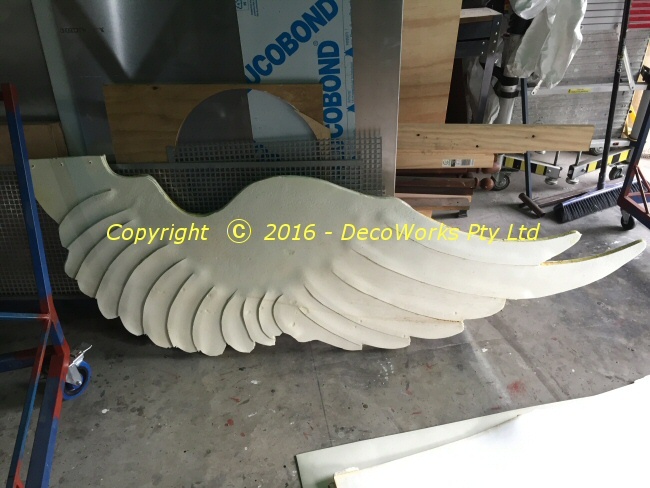 This was solved by making the bottom section of the wing with a plywood core and the rest from a sandwich of 5mm closed cell foam. 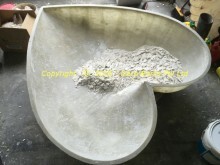 The steps of the construction are shown below. 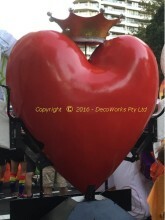 Clicking on an image brings up a larger image. 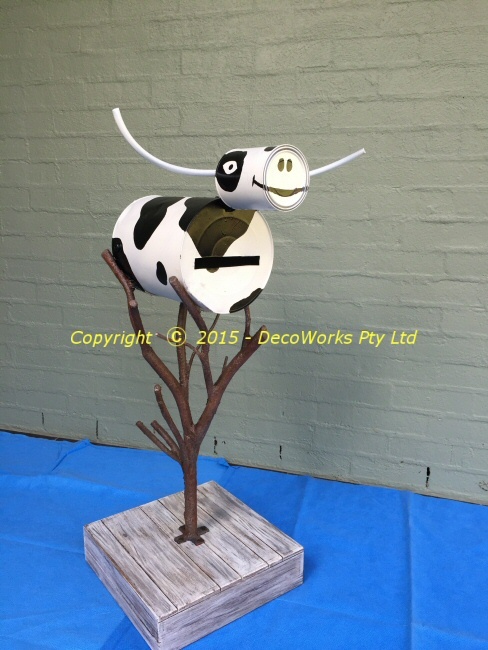 A 5mm sheet of foam was glued to both sides of the plywood and foam core for strength. Both wings have the front and back of their ply and foam cores covered in 5mm foam. 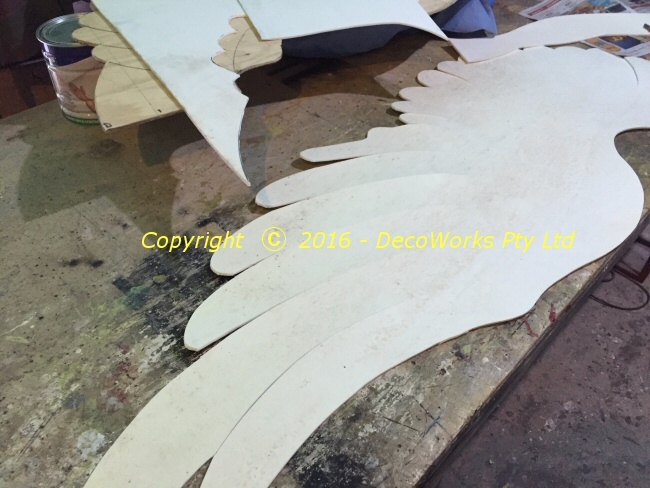 Another sheet of 5mm foam was cut out to the wing shape and the lines of the feathers were cut. Narrow strips of foam were then glued along these cuts so that when it was turned over there would be a raised feather line in the foam. Next ivory coloured cotton fleece fabric was glued over the foam wings. 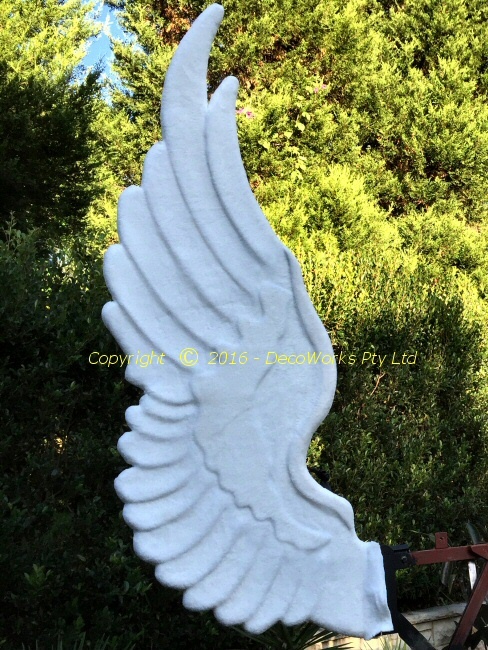 This gave the wings a softer look and highlighted the raised feathers and other detail. 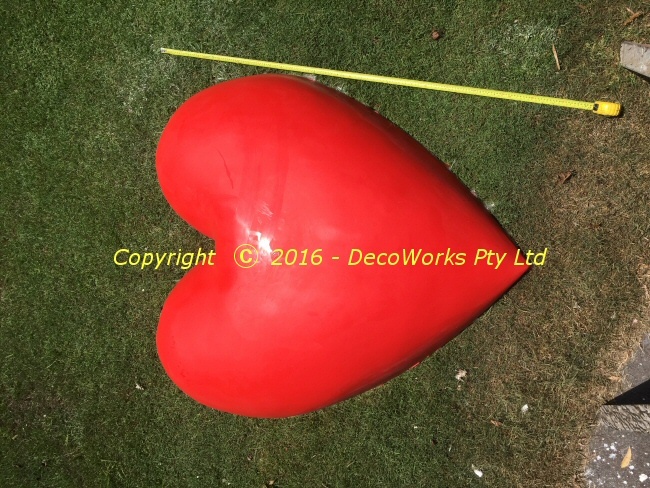 The making of a giant 3D heart for the recent Wayside Chapel winged heart project was a great exercise in how to sculpt large objects for armatures to make large fibreglass moulds. 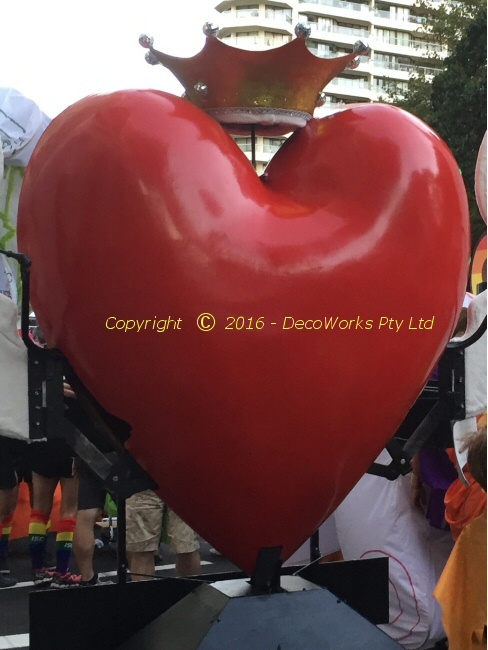 The heart had to be made as quickly and cheaply as possible so some shortcuts were made that had both positive and negative consequences. 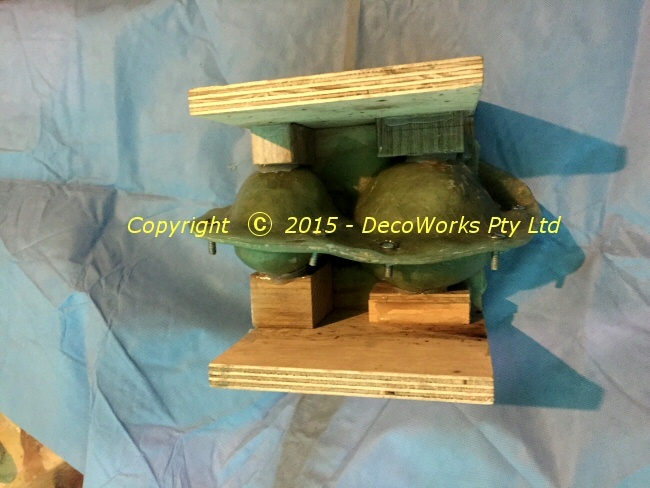 Instead of making a two piece mould it was decided to make a perfectly symmetrical half mould so both front and rear sections could be cast from the same mould. This was achieved by first drawing half a heart on a piece of plywood. 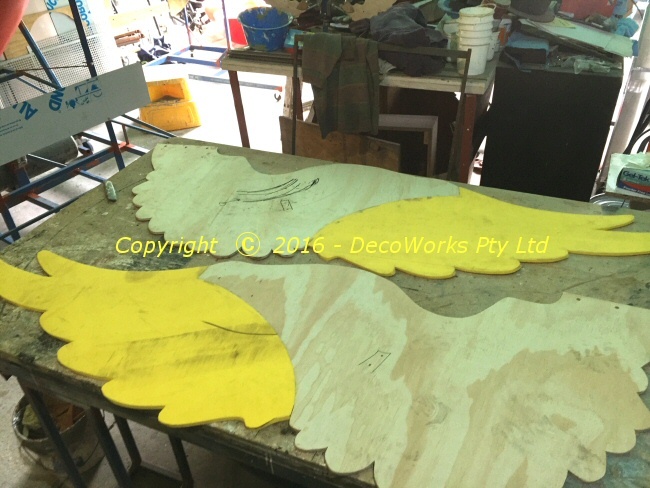 A second piece of plywood was fastened under the first and then both pieces were cut as one on a bandsaw. 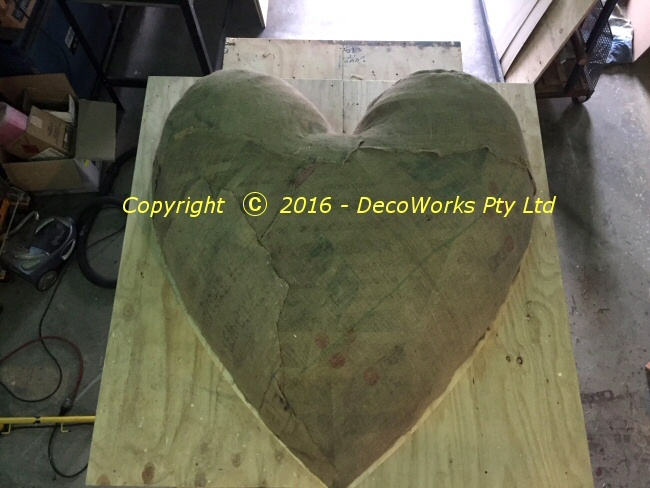 After sanding the the edges smooth the plywood *sandwich* was split and fastened together, side by side, making a perfectly symmetrical heart shape. Casting plaster was applied over the hessian covering to make it rigid. 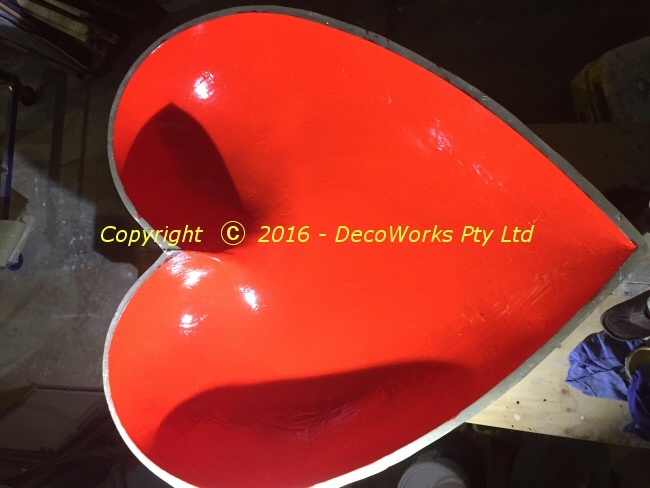 To smooth the heart shape a thick layer of Gyprock top coat filler was applied using a spatula taking care to make the layer as smooth as possible. Applying the Gyprock top coat filler over the plaster form. It was carefully filled out to match the heart outline defined by the base ply template. 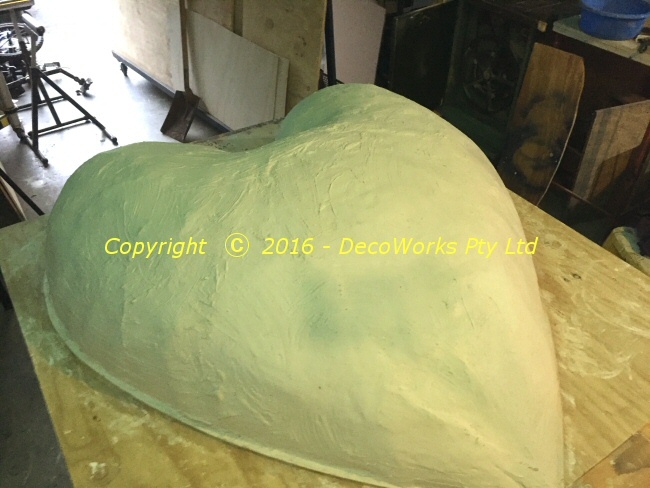 In the rush to get the mould made I decided to save time by not making the heart form super smooth before applying gelcoat and matting. Instead I would apply a double thickness of gelcoat when making the mould and then sand any irregularities from the mould directly. 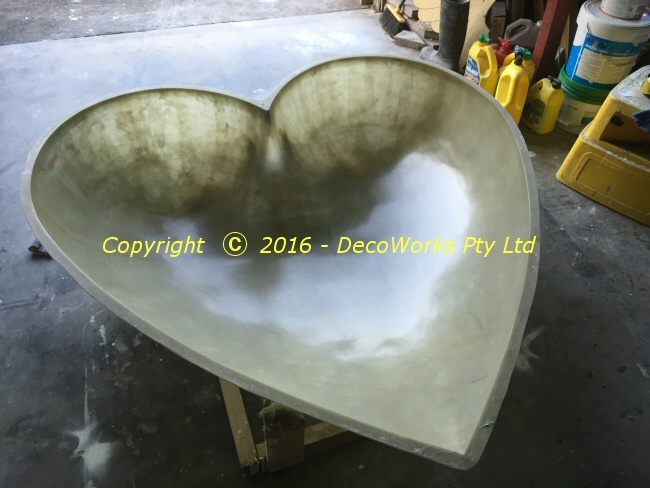 A quick coating of wax mould release was applied before applying the gelcoat and fibreglass matting over the heart form. This was a big mistake. The wax soaked into the not quite dry Gyprock allowing the gelcoat to stick firmly to the heart form making its easy removal impossible. With the fibreglassing completed the mould was ready to be removed from the form but it would not budge. 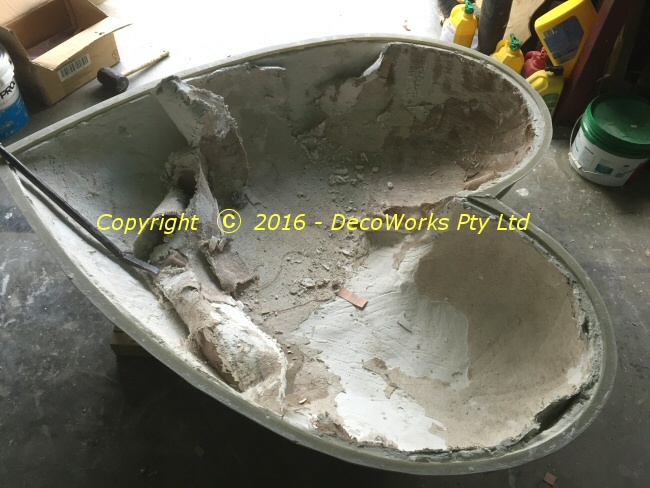 Once the ply form work and hessian had been removed there was still a thick layer of plaster and Gyprock stuck firmly to the fibreglass. 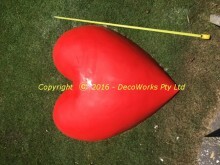 The only way to remove it was to use a hammer and chisel. The chisel had its corners rounded and the cutting edge dulled to minimise the inevitable damage that would be done to the mould interior surface. After 4 hours work only half the mould had been cleaned. 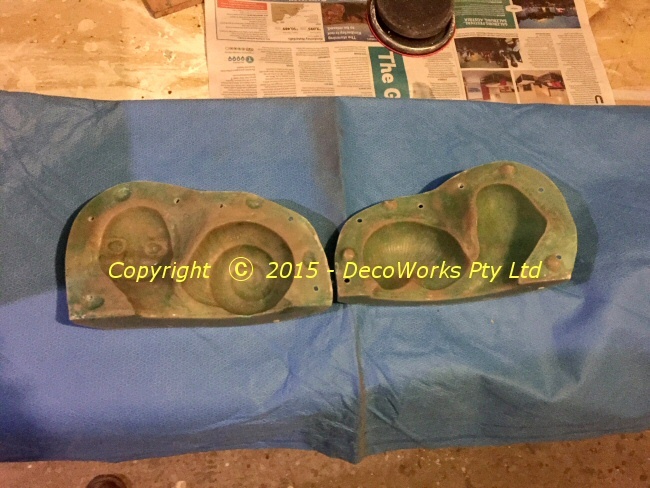 First layer of gelcoat with red pigment applied to the mould. This was followed by two layers of matting. The first fibreglass heart shell removed from the mould. It popped out very easily because the mould release was applied correctly this time. The shell of fibreglass was very flexible and had to have bracing fitted inside to make it rigid. This was done by hot glueing pieces of cotton rope on the inside and applying fibreglass matting over the top. 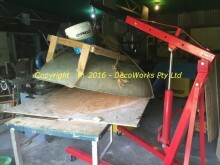 The front shell also had a steel framework fitted so it could be attached to the wing mechanism. 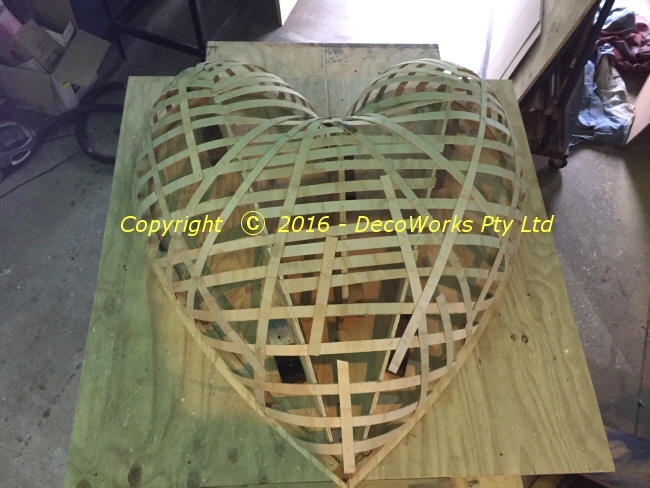 The internal bracing in the front heart shell showing the cotton rope before being fibreglassed. 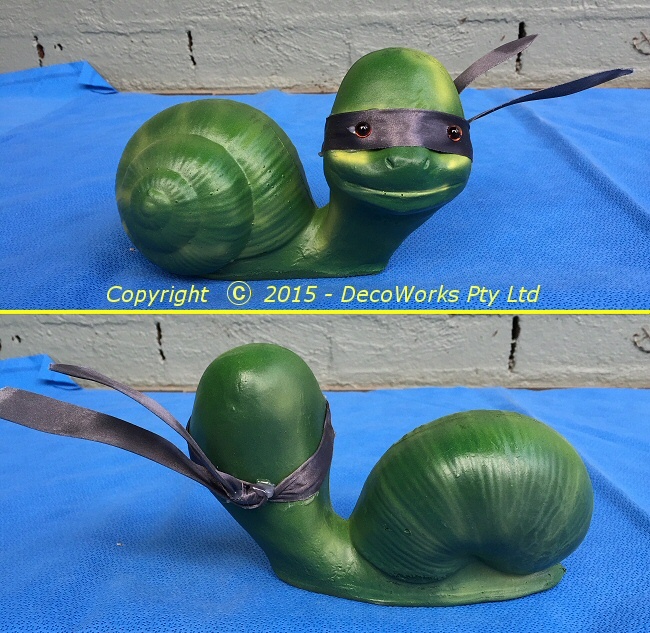 This picture shows one of the completed Ninja Snail props made for The 52 Storey Tree House stage show. 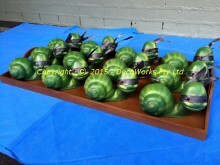 Twelve snails on a wooden tray were required for the show. Because twelve were required their overall weight was of prime consideration. 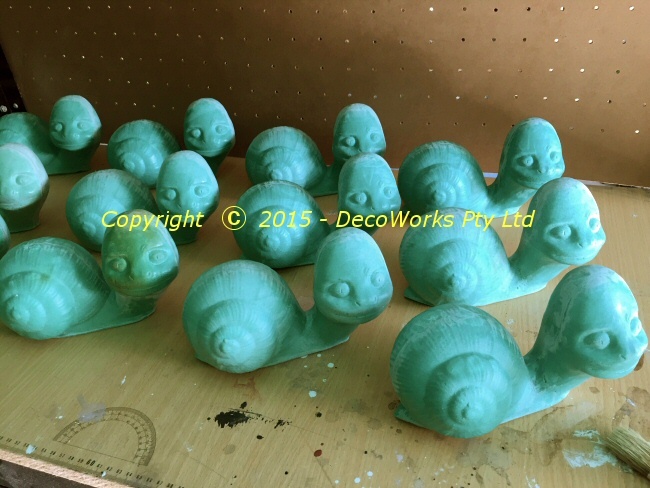 The construction technique chosen involved making a hero snail sculpture and then making a fibreglass mould. The mould was then used to cast the required snails in expandable urethane foam. 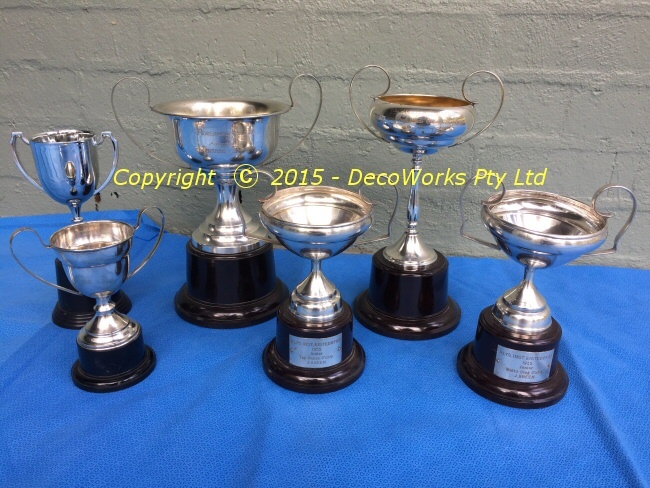 The urethane foam had the advantage of a quick turnaround between castings plus being very light. A small ceramic garden snail sculpture was found that had the correct sized shell. A new head was sculpted using plasticene over the existing snail head. 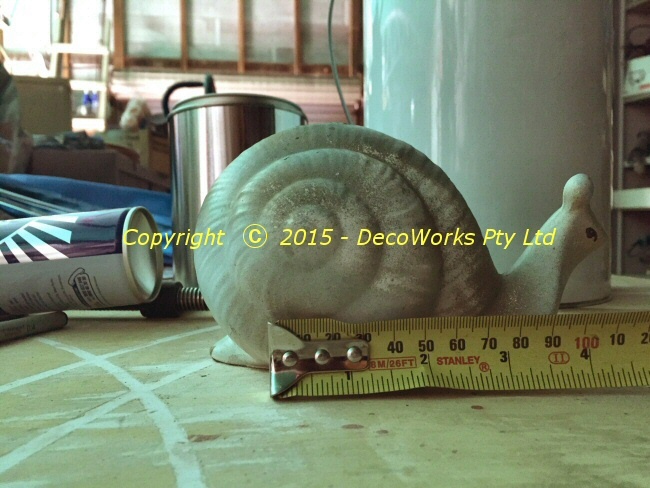 After carefully covering the snail with wax and building a flange along the centre line the first half of the fibreglass mould was made. A couple of coats of gelcoat was applied first followed by several layers of fibreglass matting. After the first half was finished the plasticene flange was removed and the other half of the snail cleaned and waxed. The second half of the mould was made in the same way as the first. 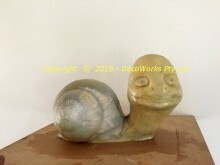 After letting cure for a day the fibreglass mould halves were removed from the snail sculpture. 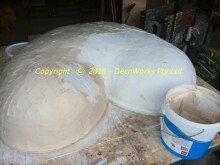 This step is usually glossed over in descriptions of mould making when, in reality, it can be the most difficult aspect of the whole process. 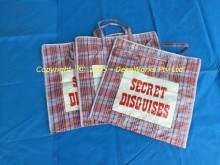 It is very easy to damage the mould if it gets stuck in unexpected undercuts etc. 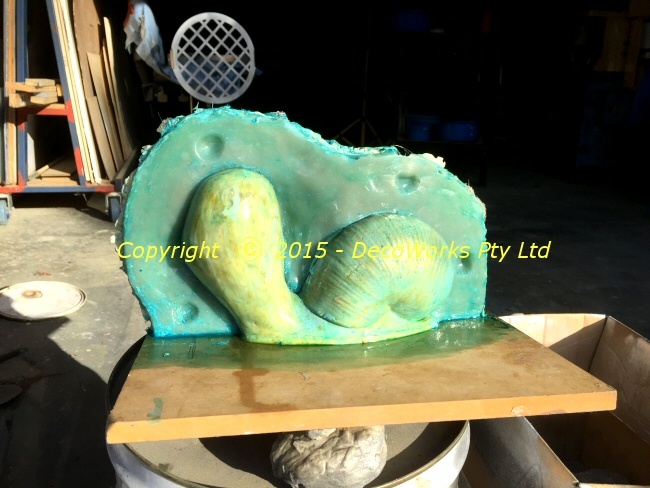 Once released and cleaned up the mould is ready to prepare for casting. 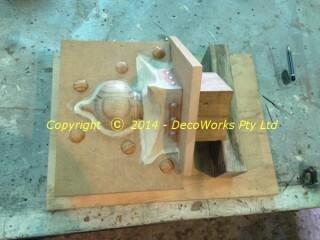 The mould is first waxed and bolted together. A wooden frame is built around the mould so that it can stand flat on the bench. This makes it easy to pour in the urethane foam. 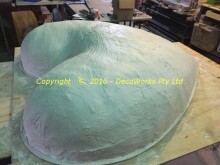 A flat cover is made to clamp over the top of the mould after the foam is poured in. A few small holes are drilled in the cover to relieve the pressure buildup of the expanding foam. 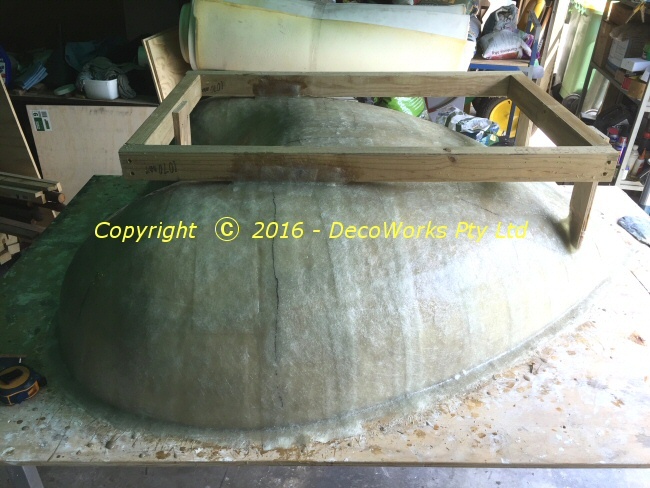 It is a good idea to clamp the mould halves together as well to prevent them distorting outwards under the pressure of the expanding foam. 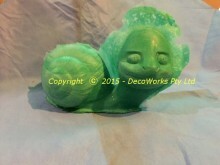 Urethane foam comes in a Part A and Part B which is mixed together by weight. 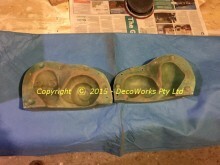 You can also add a tint to change the colour od the foam. I chose a green base since the final colour was going to be green. 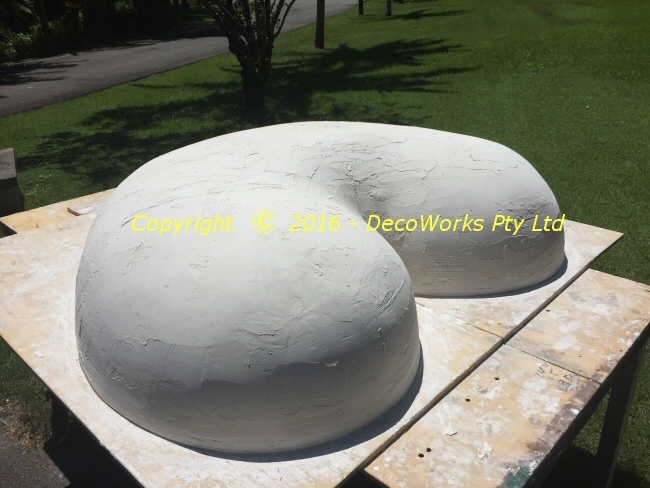 Some experimentation is needed to work out the volume of mixed foam required that will expand to fill the mould (with some to spare). 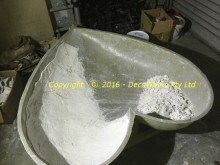 Once this is determined the two parts are poured into a container and thoroughly mixed with an electric drill attachment for a minute. 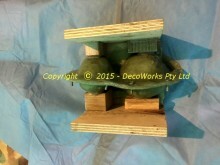 It is then quickly poured into the mould and the top cover clamped in position. 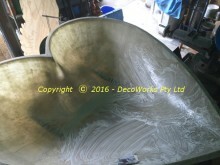 Within minutes the foam will expand filling the mould and releasing the excess out the vent holes in the cover as shown. 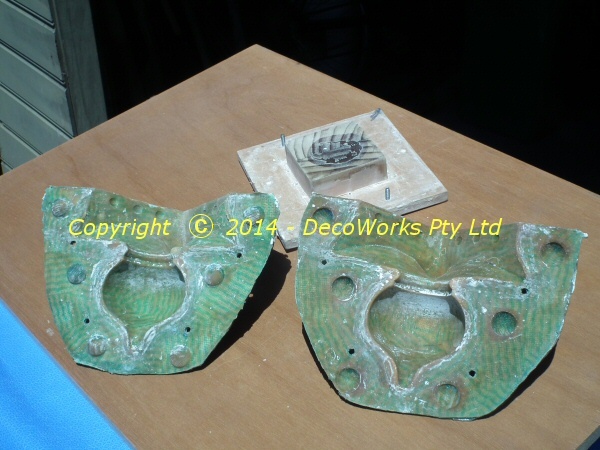 After about an hour the clamps can be removed and, if mould release has been correctly applied, the casting should pop out from the mould. 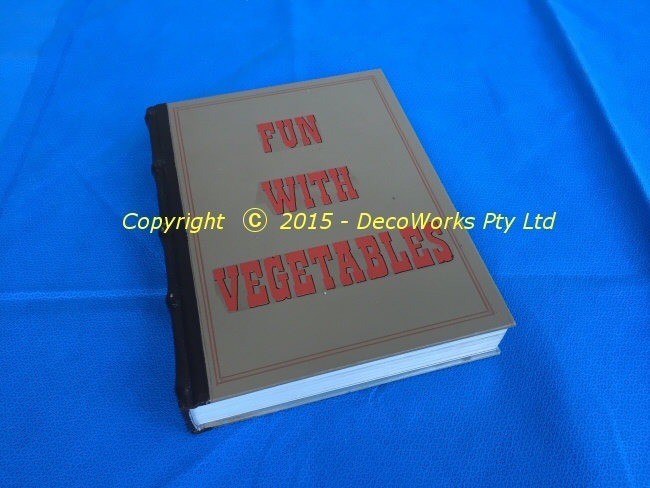 Again, this is sometimes not as easy to do as is often portrayed in “how to” videos. 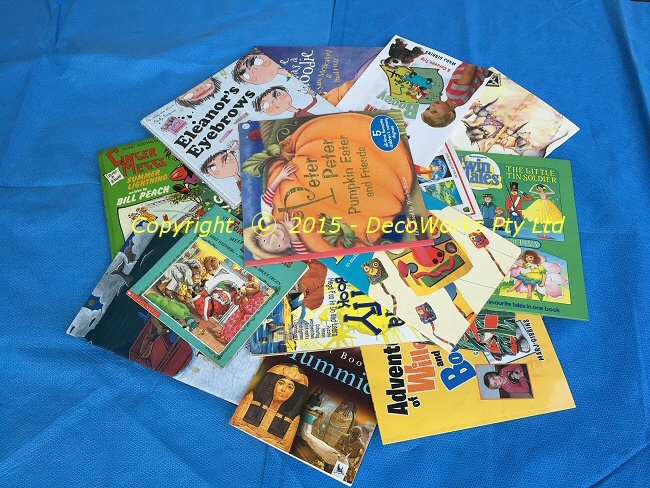 You will get quicker as you learn the dynamic of the materials. It is doing this part of the process that highlights how strongly you made the flanges of the mould. It often requires quite a bit of force to pop the mould halves from the casting and the mould can be damaged if it is not strong enough. 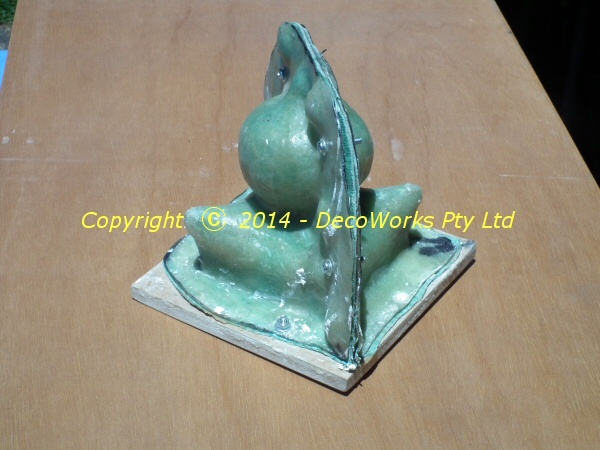 Foam inevitably seeps between the mould halves but this is easily trimmed off. 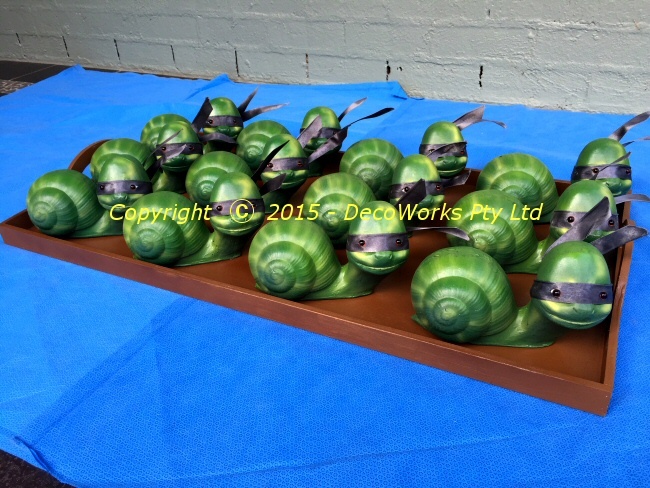 The final step is painting the snails and air brushing on highlights. Small plastic eyes from Spotlight are glued in position under the ribbon masks. 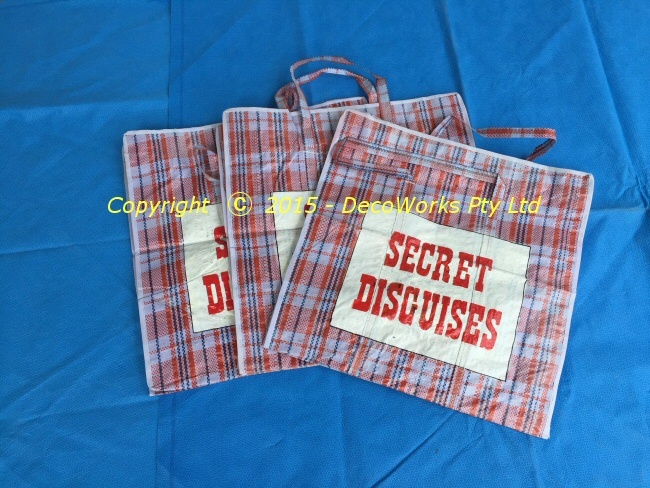 The ribbons themselves are folded in half and glued with some florist wire which allows them to be shaped as required. 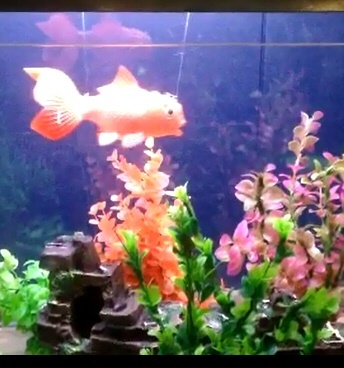 A recent stage production required a prop aquarium in one of its scenes. 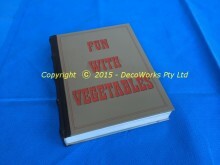 An empty Perspex box with some water plants and a fish hanging from the prop aquarium light had been provided but it was a very static arrangement. The designer requested some way of giving the fish some movement within the aquarium. The mechanism we designed is basically a miniature cable car. 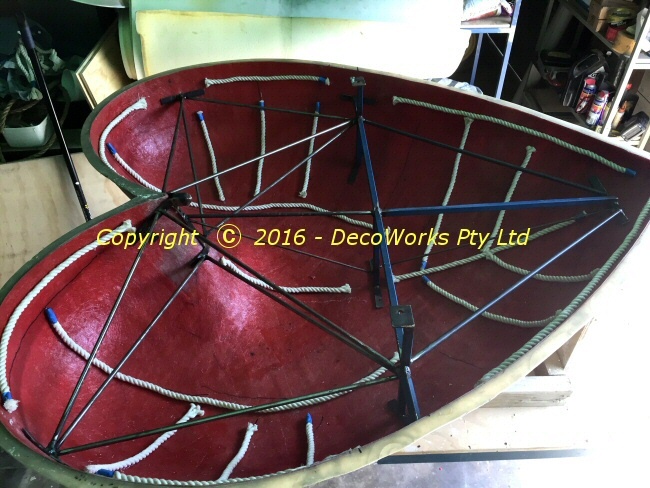 Two large pulleys have a continuous steel cable around them which is tensioned so that the rubber fish can be suspended from the cable. A 12V electric motor drives one of the pulleys via a belt drive which causes the cable with the suspended fish to move around the interior of the prop aquarium. 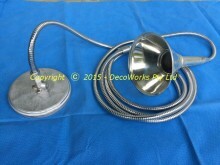 The second pulley is spring loaded to maintain a constant tension on the cable. The video below shows the operation of the mechanism and illustrates its layout. Once the Japanese bridge had been built and installed the making of the custom oriental style finials to fit on each bridge post could begin. 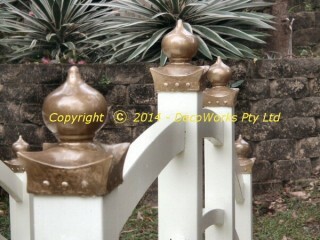 The post trim on decorative garden bridges (if any) are usually round wooden finials from a local hardware store. These are great for a Victorian staircase bannister but are not an exciting option for a Japanese bridge. With this in mind we decided to design our own oriental style finials that would enhance the Japanese flavour of the bridge. A common finial shape on Japanese bridges is an onion-like sphere mounted on round bridge posts. Our bridge had square posts so the onion shape was combined with traditional Japanese roof design so it would fit to the posts. 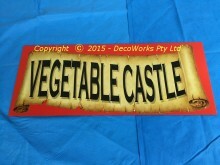 The final result compliments the Japanese style of the rest of the bridge. 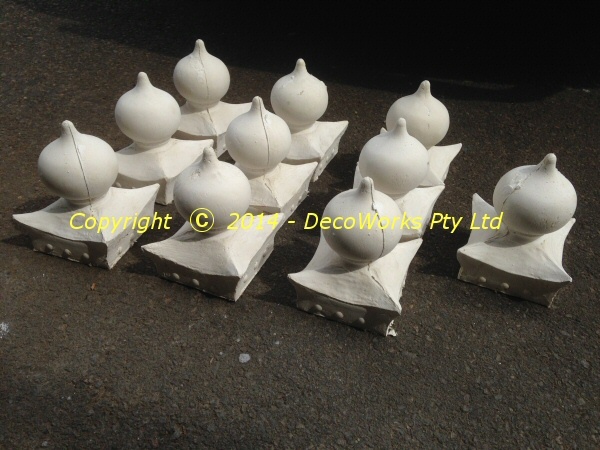 To keep costs to a minimum it was decided to cast the finials in plaster. Hessian was used around the edges where it was thinner to add reinforcement to the plaster. Several “drop tests” were made which proved the plaster cast to be very robust and suitable for dressing the bridge. 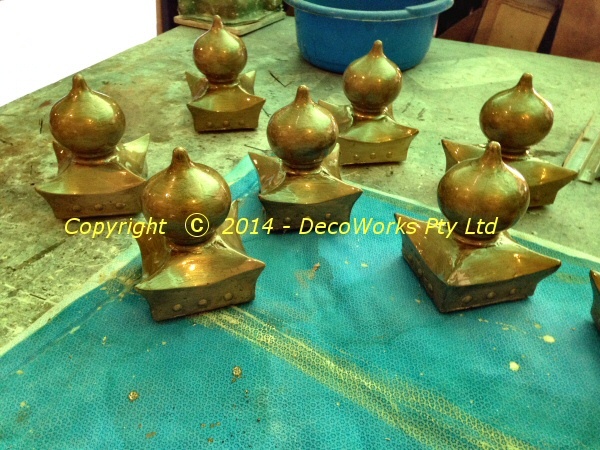 The finials were sealed with shellac and finished in gold enamel paint. The bright gold dulled over a period of weeks to leave a nice metallic bronze finish on the finials. 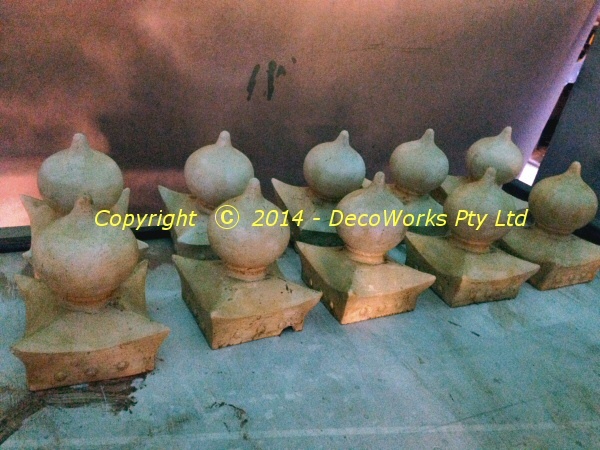 The completed oriental style finials will now be fitted to the posts of the Japanese bridge.